"Ellen Page and Evan Rachel Wood were phenomenal in this film. Poignant, bittersweet. A powerful and moving portrayal of sisters trying to survive the end of the world. Awesome!" 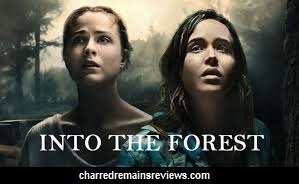 Recently I discovered new film on DVD starring Ellen Page and Evan Rachel Wood called INTO THE FOREST. At first glance of the synopsis, I almost put it down. The description included one word that I am tired of seeing...Apocalyptic. Most "apocalyptic" films include zombies and with a genre overrun with the shambling undead, I almost missed out on a really good story. The entire synopsis reads, "Set in the near future, this riveting and suspenseful apocalyptic drama follows two sisters whose peaceful lives are disrupted one day by a world-wide power outage. The sisters must work together in order to survive in their increasingly treacherous new world, fighting intruders, disease, loneliness and starvation." NO mention of zombies just that one descriptive word, "apocalyptic" that screamed zombies must appear at some point. I walked away from the film and something made me turn around and go back and I so, so very glad that I did. I highly recommend this film and I will tell you why without spoilers. It is true there is a power outage that affects the current living conditions for the area in which Nell (Ellen Page/X-Men Future Past/Juno), sister Eva (Evan Rachel Wood/Westworld/Across the Universe) and their dad (Callum Keith Rennie /Longmire/Warcraft) reside. The coolest aspect is their house. It was automated and functioned by command. When the power first went off the small family commanded the power to come back on. It reminded me a little of the old "clapper" commercials in which customers would clap their hands to turn their lights on/off. Unfortunately for Nell, Eva and their dad the command failed as the power remained off. Time passes and as it becomes obvious something is wrong. A trip to town revealed gas outages and missing neighbors and a nearly empty grocery market being run by a shady employee named Stan (Michael Eklund/Dirk Gently's Holistic Detective Agency/The Call). Dad and the girls do their best to secure candles, food and necessities to survive until the power is restored. Rumors and speculation is heard by several people that it was a terrorist attack that led to the power outage, but nothing is confirmed. The trio returns home and come up on a situation that troubled the dad and he decides there wouldn't be any further trips into town until he felt it was safe to return. This is not what either girl approves of for different reasons (no spoilers) and it is clearly noted by teenage rebellion and words that cannot be taken back. A terrible accident occurs that thrusts the siblings into a harsh new reality. They are forced to come to terms in a startling way and relying on each other's strengths and weaknesses they persevere with a vast array of knowledge found in books from their home. They begin to seek out plants for food and medicines that grew in the forest surrounding their home based on their research. A empty jar of jelly is given a fix in the discovery of berries and the instructions to make more. The sisters seemed to be adjusting well to the life altering changes, when an intruder comes along leaving in his wake devastation and consequences for Eva that takes the sisters into another learning curve that almost becomes too much for one and alienates the other. I found the pacing of the film to be slow as it showed character development and added to the suspense. With each moment, I sat watching and aching for their suffering and laughed and shared in their small comforts and joys in the course of an hour and forty-one minutes, I came to care about these sisters and waited with hands clenched during the most intense situations to see how they would handle the chaos and upset. Their relationship was loving and poignant, but they had their moments with tempers that flared and tension that broke out between. In one scene, Eva begged her sister to use their gas to start up their generator, so she could listen to music and watch videos of their deceased mom. The harsh reality that that gas was too precious to waste created argument that just couldn't be justified no matter how either of them wanted to solve it by giving in to the luxury. The ending was satisfying and raised an eyebrow that no matter what happens there is always hope and with love, determination anything is possible even in the darkest of times...hope survives. If you want to see a good character driven, well developed film with beautiful cinematography and a lot of heart, rent or buy a copy of INTO THE FOREST and see for yourself why I gave the film 4 out of 5 for an excellent indie film that remained with me long after the credits faded away. Below is the trailer and links for the film.